Arsenal News 28 February 2012 | "It's all about the Arsenal"
Morning… Don’t touch me now, I’m having such a good time. I’m having a ball………….. Hope the weekend’s humiliation of the needy from Down the SSR is still keeping you feeling good too. As is my want, after arriving home and her indoors laying out a nice goulash, me and the boy watched the highlights again….. And again….. And again….. And them I watched on Sky Premier goals at 10pm after Whitechapel. Pretty sure I’ll tune in tonight as well. I Paid attention to crowd after third watch of the match. When Rosicky scored they went mad and the noise were amazing. Then at 4-2 even louder, you could feel the relief that 4 had settled it. The “we’re by far the greatest team, the world has ever seen” was sung with gusto..
Then when the 5th went in, the look on the Spuds faces when the TV panned onto them was priceless. These are treasured moments in football and a smack back for Spuds 5-1 defeat of Arsenal in the Worthless Cup. I see Arsenal took the opportunity to release financial figures after the win. Clever. @swissramble or @theN5er can sort that out, their very good at it. Here’s a good link to Arsenal v Spurs as it happened, worth a read and also comments. I see Arsenal dot-com has S13 talking about Theo scoring all the time in training. I’ll own up, Theo was seriously bugging me in the first half Sunday. He just could not do anything right. Total confidence player is Theo. Thing is just when he hits a rich vein by either assists or scoring, he slips back into a lack of confidence so easily. There has been no consistency for 6 years. Right! Theo has had his fair share of injuries which has not helped, maybe we can cut him some slack, but right now he need to get his right. Theo has speed and speed works well in today’s football. Trying to run with a ball though a full pelt is nigh on impossible, you can’t keep control of the ball. Theo needs to be played in through the channels, Like Song did. How many times is Theo away then and yet looks back and loses that speed advantage. Theo needs to look at Messi, once he goes for goal, he does not look back, like Italian drivers, “Whatssa beind dunna matter” just go for goal. Also, when Theo has little time to think, is when he is at his best. Instinct player, rather than a player with all round vision like Cesc. If there is one player who is at Arsenal that I, and I think I can speak for many Gooners that I want to do well it’s Theo. I’d be so happy for him. I seriously hope that at last Theo can take the two goals from Spurs and take it forward. Just go for it Theo. Also today sees quite important news that August Friendly matches will be taken out of the International calendar. This has to be good news. Also I see the Sun like a good tweak. Headline Gunners chief Ivan: Gunner fans slam Gazidis for saying 5th place won’t hurt . I doubt he meant like that, but hey when you need to fill the column inches, anything is fair game. Arsenal and their finances, amazing how it can cause such division and news. Clubs are going into adminstration, massive debts, robbing Peter to pay Paul, writing cheques they cannot cash and yet the one club that looks to be doing the right thing by the game is fair game for the media. What do they actually want Arsenal to do? Pay hundreds of millions they can’t afford, so the media can grab headlines of our new signings. Win everything, every season. If they did then what happens, do they just move onto City, United, Chelsea to write, moan and pick on them. Finally Important message from me.. Tomorrow would have been the 6th Birthday of this young Gooner. Tragically his life was cut short by an accident while on holiday. 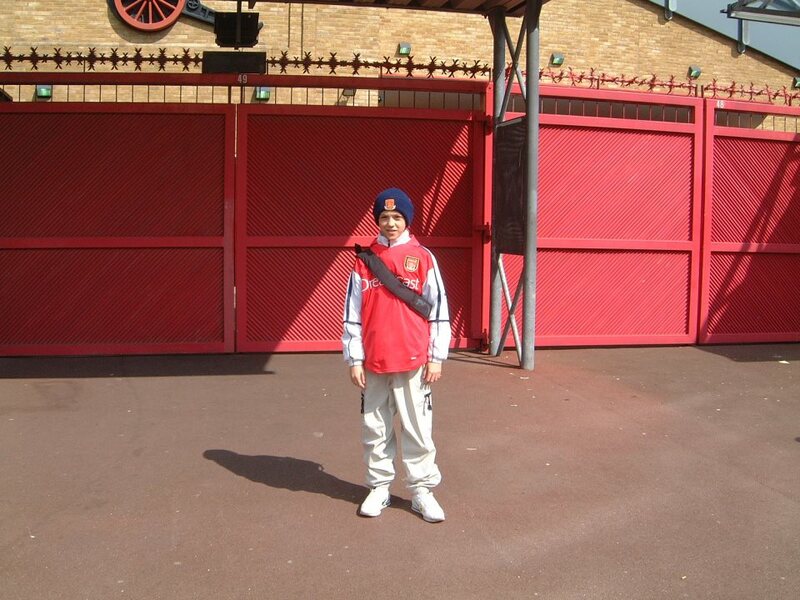 Mark was a lovely boy and I took this photo of him when I took him to Highbury. Mark is missed by so many people.